United States Federal Security Clearances are done thru a procedure OUTSIDE the American White House…. So when the media questioned the fact that Jared Kushner had a lower level security clearance, even though he had been doing Trump business in the early days of the his father-in-law’s Presidential admin stuck me as interesting…. Kushner is the son-in-law of the President of the United States…. Donald Trump isn’t a guy about procedures…. He’s guy that simply wants what he wants…. WTF would anyone think Jared Kushner wasn’t gonna get an ok? 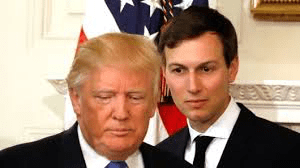 Do NOT surprised if a judge ends making the final judgement call on if the Congress can get to the nitty gritty on the granting of the security clearance for the President’s son-in-law…. Last week he expanded the committee’s investigation into the clearance process after The New York Times reported that President Donald Trump ordered his former chief of staff to grant Kushner, Trump’s son-in-law, a full security clearance despite reservations from intelligence officials….